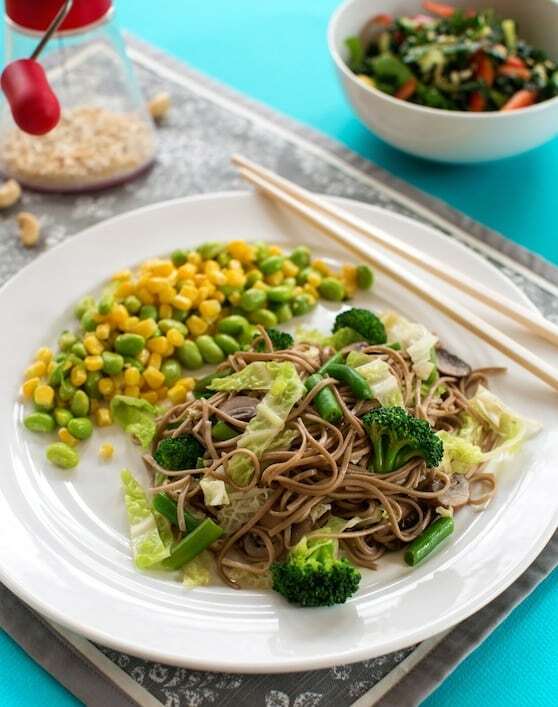 It’s so easy to make vegetable lo mein, a Chinese take-out favorite, at home—and it’s lighter and less heavy on the oil than its restaurant counterpart. 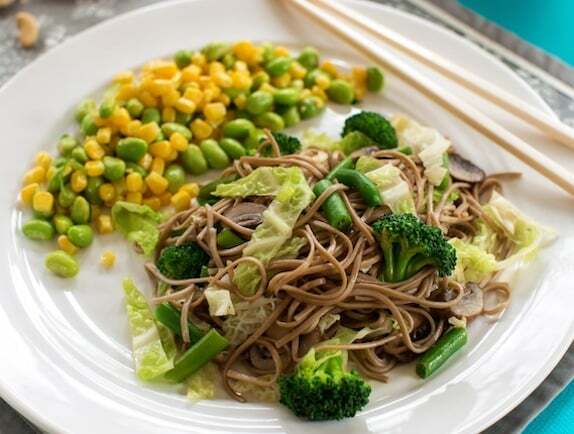 Serve this with a simple combo of corn and edamame as shown in the photo; or with a tofu dish. Either way, round out the meal a simple crisp salad. Recipe from Plant Power: Transform Your Kitchen, Plate, and Life with More Than 150 Fresh and Flavorful Vegan Recipes by Nava Atlas. ©2014, published by HarperOne, reprinted by permission. Photos by Hannah Kaminsky. It’s so easy to make vegetable lo mein, a Chinese take-out favorite, at home—and it’s lighter and less heavy on the oil than its restaurant counterpart. Cook the noodles according to package directions in plenty of rapidly simmering water until al dente, then drain. Meanwhile, heat the safflower oil, broth, or water and 1 teaspoon of the sesame oil (if desired) in a stir-fry pan. Add the cabbage, broccoli, and green beans. Cover and cook for 2 to 3 minutes. Add the mushrooms, if desired, and scallions and stir-fry over medium-high heat for 5 minutes or until the vegetables are just tender-crisp. Add a small amount of vegetable broth or water, just enough to keep the pan moist. Add the cooked noodles to the stir-fry pan and toss together. Add the remaining teaspoon of sesame oil, if using, then season with soy sauce and pepper to taste. Serve at once. Note: When you’re in a hurry, you can substitute 8 ounces of preshredded coleslaw (preferably with carrots included) for the green or napa cabbage. And fresh, slender green beans are hard to come by for much of the year, so I give you my full blessing to use frozen organic whole baby green beans, which are consistently excellent—and also save you the time and trouble of trimming the ends. Use whatever you’ve got in the fridge in place of or in addition to some of the veggies called for in the recipe—romaine lettuce, mung bean sprouts, and/or bok choy in place of cabbage; broccoli rabe or Chinese broccoli instead of regular broccoli—it’s all good! Turn this into a heartier dish by adding 8 ounces seitan, cut into narrow strips, along with the cabbage, broccoli, and green beans. Find more of VegKitchen’s Vegan Dinner Recipes. Here are more recipes using Asian noodles.